I love the smell of earth and grass just after the rain, when it is not too hot and not cold either. I love how the air feels fresh and clean and the world just seems like a fresh and lovely place taking a deep breath seems like a glass of energy drink then. Lovely collection ! I also like the smell of nature after a good rain storm !! Oh yes, that's a great moment. :) Pretty collection! A gorgeous collection - the smell after the rain stops is the best thing about summer thunderstorms! Agreed! Lovely finds on your moodboard as well! Amazing fresh and natural. Wish you a good week! hmmmm...en de geur van vers gemaaid gras ...heerlijk!! Very pretty and fresh mood board! It was raining here,too in the morning. But now sun showed its face a little bit. Love the feel after the rain as well! Beautiful collection!!! 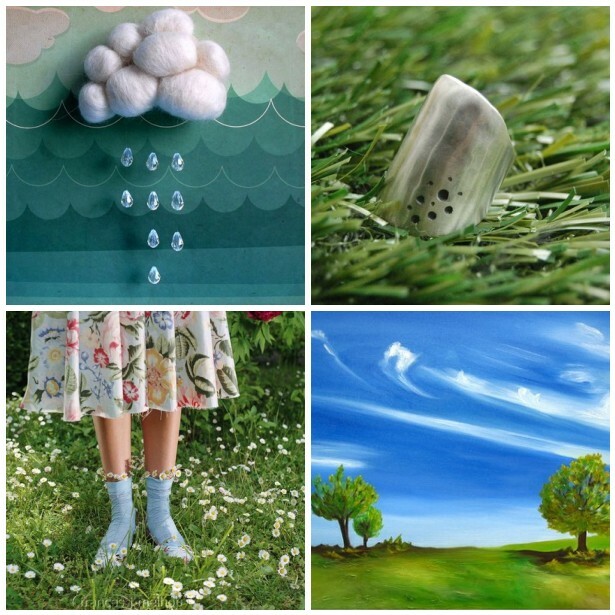 wonderful moodboard, very fitting to today's weather! thanks for sharing! Gorgeous! I love the idea and the finds! Beautiful finds for the theme! I agree with you the smell is lovely after it has been raining. I have always loved early summer mornings (sunrise) because the dew makes the flowers and grass smell so lovely. oooh, I love it!!!! gives me a very happy feeling! Gracias guapa por ponerme en tu moodboard, siempre es una linda sorpresa, ya sabes que tu blog me encanta y nunca dejan de sorprenderme e impresionarme.